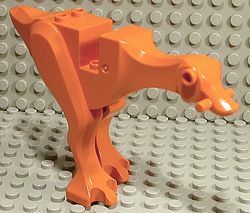 A Kaadu is a Star Wars animal introduced in 2000. It is exclusive to the set 7115 Gungan Patrol. The Kaadu was a type of flightless reptavian native to the lush world of Naboo. They came in various shades of yellow and orange. Due to the natural terrain of Naboo, these creatures had a natural ability to survive both in the watery swamps and rich grasslands found throughout Naboo. They were effective in both, as they were very strong swimmers and fast runners, capable of surviving underwater for two hours. They were utilized to a great extent during the invasion of Naboo. As a riding animal, the figure has a recess that could accept a standard saddle piece just like a normal horse. A piece originally conceived as a stretcher holder acted as a bridle. This page was last edited on 14 July 2016, at 11:32.